Are you off to Barcelona on your year abroad? Send your luggage with My Baggage! My Baggage is the No.1 student shipping company. 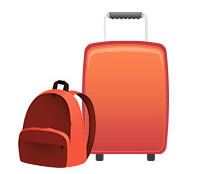 We help over 30,000 students transport their luggage to and from university every single term. We offer a fast, reliable and affordable international student shipping service to make your journey abroad that little bit easier. Located just minutes from the Mediterranean coast, Barcelona is a dream destination for any international student choosing to study on a year abroad. Barcelona is a forever progressive and innovative place to be, as it is a city that is bursting with character and boasts and undeniably rich history. There is so much for students to see and do in this coastal city, from popular tourist spots, to endless tapas bars and plenty of night-life. Booking your luggage shipment to Barcelona with My Baggage is a quick and easy process. There is no complicated sign-up process – all you have to do is register your email address to make a booking. Get started by getting a quote on our homepage. You’ll need to know your luggage weight and dimensions, as well as your collection and delivery address details to complete your booking – so make sure you have this information ready. For the address in Barcelona, we recommend providing a local Spanish number – be that your own or someone you trust – just in case the courier needs to contact you about your shipment directly, as they will not be able to call UK numbers. Once you’ve booked, we’ll send you some labels to print and attach to the items being sent. After that, we’ll take care of the rest. We’ll collect your items and deliver them straight to where they need to go in Barcelona. For your convenience, My Baggage offers a hassle-free door to door service. You’ll be given access to full online luggage tracking, as well as SMS and email notifications to allow you to keep an eye on the step-by-step progress of your shipment in transit. 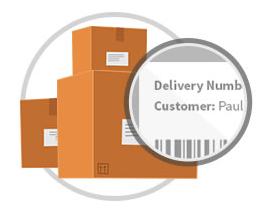 The tracking information will update to let you know when they are out for delivery – so you’ll know exactly when to expect it. If you happen to have any questions or concerns along the way, we have a dedicated customer support team who can help via phone, email and live chat. Don’t hesitate to contact us with any queries you might have! Convenient door to door service to all addresses in Barcelona. Super fast international shipping times. The last thing any international student wants is have to wait weeks for their luggage to arrive with them in a new and unfamiliar country. After all, you don’t want to be without any of your home comforts. Thankfully, when you book your luggage shipment to Barcelona with My Baggage, you can be sure it’ll reach you at its destination fast. My Baggage provides super fast luggage shipping times, with 3-4 days on our Economy service and 1-2 days on our Express service. My Baggage provides £100 free compensation cover on every single shipment. You can increase this value right up to £1000 during the booking process for a small additional fee if you wish. Before booking your shipment to Barcelona, we strongly recommend reading through our list of prohibited and no-compensation items to ensure your parcel is covered. As recent graduates, we at My Baggage understand that a student’s budget doesn’t tend to stretch too far. Especially when you’re a student who is about to move abroad for a year, as there can be a lot of unexpected costs to consider. That’s why we strive to make sure our prices reflect a student budget. With My Baggage, you’ll receive a generous 30kg weight allowance – that’s almost double most airline baggage allowances. That means that with My Baggage, you’ll have the freedom to bring everything you need at a fantastic low price. We also have a very handy ‘Price Match‘ too, so if you happen to find a cheaper price elsewhere, just let us know and we’ll do our best to beat it. 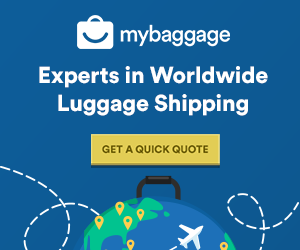 See how much you could save on your luggage shipment to Barcelona by getting a quote from My Baggage today.